Come connect with others through prayer, social, reflection and service opportunities. On the 4th Monday of every month, join us for the evening meal at 5:30 PM and Centering Prayer from 6:15 - 7:00 PM. Centering Prayer is a spiritual practice of acknowledging God's presence and action within a person. One enters into this prayer by sitting in silence for at least 20 minutes, freeing oneself from any particular thoughts, making oneself completely available to God. Centering Prayer is not meant to replace other kinds of prayer; rather, it adds depth of meaning to all prayer and facilitates the movement from more active kinds of prayer, verbal or mental, into a receptive prayer of resting in God. Contact Sister Sheila Ann Dougherty for more information. Arrange to enjoy evening prayer and dinner with Presentation sisters, come individually or as a small group. Contact Sister Rita Cameron to schedule this opportunity at any time. Participate as a prayer partner with a Presentation sister or associate by e-mail, in person or a combination of both. This opportunity to connect with a sister or associate may feed your spiritual growth and prayer. Both participants decide what works best for their schedules to develop and maintain this prayer partnership. Contact Sister Rita Cameron to learn more. Adult women are invited to participate in day-long retreat for spiritual and personal growth and discussion on a variety of topics. These retreats are offered regularly throughout the year or may be scheduled for a group by special arrangement. Contact Sister Rita Cameron to learn more. Explore a deeper understanding of God while serving the needs of today. Presentation Quest empowers participants to take action by providing opportunities for service and immersion. Contact Sister Rita Cameron to learn more. 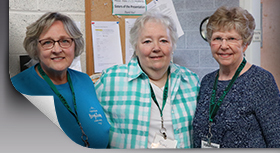 If you desire to strengthen your commitment to gospel values and deepen your prayer life or welcome opportunities for friendship, faith sharing, spiritual growth, service and hospitality, consider becoming an associate. Together, sisters and associates share in prayer and partner in mission. They work collaboratively to live out the Presentation spirit of presence, hospitality, and compassion for those in need, and demonstrate respect for all people. Contact the Associate Partnership Office to learn more.